In the last activity, Out of Africa, students examined the locations and ages of hominid fossil finds to discover the paths of hominid migration out of Africa. Prior to about 1500 AD, skin color followed a particular geographical distribution, and people with the greatest amount of skin pigmentation were found in the tropics. In this activity, students sample a container of colored beans and construct a histogram to learn about the genetics of human skin color. This activity will aid students in understanding the next one, Pigmentation & UV Intensity, in which students will observe that skin colors are not randomly distributed and use a database to suggest a hypothesis for why skin pigmentation varies with geographical location. Explain how skin pigmentation is genetically determined by contributions from the mother and father and how offspring can vary in skin pigmentation. Students observe images of people with a variety of skin pigmentations. Students simulate the combinations of pigmentation genes from two parents. Students graph data and discuss the results of recombination. Teacher explains melanin and the wide variability of skin pigmentation due to multiple genes controlling the trait and introduces the next activity. Teacher collects and assesses the student activity sheets. Collect students' work from the previous day's activity sheets: Hominid Migration Student Activity Sheet, Migration Comparison Student Activity Sheet, and Who, What, Where, When, and How? Student Activity Sheet. 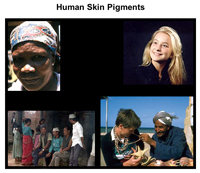 On the computer, display the slide show: Human Skin Pigments (3 slides). Comment to the students that it is obvious that people from different locations around the world vary in their degrees of skin pigmentation. Explain that today students are going to conduct an activity that will help them gain a better understanding of skin pigmentation and how it is inherited. Organize students into teams of three. Give two cans of beans and a copy of the Genetics and Variation Student Activity Sheet to each team. Assign two students from each team to draw beans from the container and one student to record the information. Give each team a group number, from 1 to 11, and ask the recorder to write his or her group number in the title of the table in Part I of the activity sheet. Make sure students understand the directions for Part I on the activity sheet. Explain that three genes are responsible for skin pigmentation and that each parent contributes one each of these three genes to each offspring. In this simulation, the two cans represent the two parents. The beans represent the genes. Explain that the students are going to simulate the range of possible offspring of these two parents by randomly drawing six (three from each parent) beans from the cans. Instruct groups to complete Part I of the Genetics and Variation Student Activity Sheet. Display the transparency: Class Totals. Tell the groups to record their totals (from Step 7 of the activity sheet) next to their group number on the overhead transparency when they finish. Add up the teams' totals and fill out the bottom row of the transparency: Class Totals. 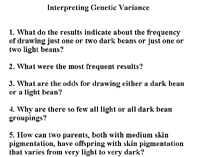 Direct students' attention to Part II of their Genetics and Variation Student Activity Sheets. Tell groups to use the Class Totals on the overhead transparency to construct a bar graph. Allow groups five minutes to complete their bar graphs. When all groups have finished, display the image: Interpreting Genetic Variation. Ask students to take notes on these five questions as the class interprets the results of Parts I and II of the activity. Tell them that they will need to refer to their graphs. What are the odds for drawing either a dark bean or a light bean? (50:50, one in two, or equal, assuming there was an equal number of each color of bean in the can). 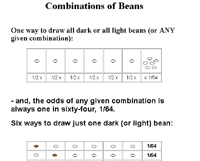 Display the image: Combinations of Beans and briefly go over the combinations to ensure that all students understand why the numbers of possible combinations vary. Remind the students that they were simulating possible offspring of two parents, both of whom have medium skin pigmentation. If these were real parents, what would be the possible range of skin pigmentation in their children? (Like the beans; a few offspring would be very light or dark, but most would have medium skin pigmentation.) Explain to the students that most variations in offspring are due to genetic recombination, especially when there are multiple genes for a trait, and that most traits are controlled by multiple genes. Tell students that skin color is influenced by a variety of substances, the most important of which is melanin (a molecule that is produced by specialized cells in the skin). In this activity, the beans represent the genes that are associated with the production of melanin. If the light bean represents the absence of the production of melanin and the dark bean represents the production of more melanin, the more dark beans you have in your sample the greater will be the melanin production and the darker the skin color. Explain that some individuals have the genetic ability to temporarily increase melanin production in response to a factor in the environment' sunlight or ultraviolet light. This adaptive process is called tanning, and is only a temporary change in the amounts of skin pigmentation. Other individuals cannot increase melanin production and burn rather than tan in the presence of sunlight. Show the slide show: Human Skin Pigments again. Ask students: Do all populations of people around the world show a range of skin pigmentation, from very light to very dark? (No.) Tell students that in the next activity they will be exploring why populations vary in skin pigmentation. As desired, collect and evaluate students' work on the Genetics and Variation Student Activity Sheet . Purchase approximately 2,000 each (approximately one pound) of two different colors of beans that are about the same size. If it is easier, you can buy all the same color of beans and spray paint half of them a different color. Collect enough containers so that each team of three students has two.  Dump one level measure of each color bean into each container. (This will be approximately 200 beans.) Mix the two colors of beans thoroughly.  Prepare enough containers for each student team to have two, and for you to have two demonstration containers.